Don't Look Down: Venus de Miles-a bike event done well! Disclosure: I received a free entry into Venus de Miles without a fundraising requirement. All opinions are my own. Last Sunday morning I got up bright and early for the second day in a row. How can I get up at 5 am on the weekends but struggle to wake up by 6:30 am on the weekdays? I don't get it. I loaded all my gear up and strapped my bike on my new bike rack. 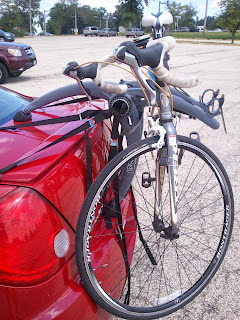 I scored this Saris Bones bike rack for $10 at Goodwill. I've been patiently searching on Craigslist for one of these for several months because I only wanted to pay around $60 so my mom and I couldn't believe it when we found this at Goodwill. What a steal! It was an easy drive up to Lake Forest and I had no problem finding a parking spot on campus. Soon after I parked, Katie and Lauren pulled in a few spots down and we made the short walk over to the starting area together. Packet pick-up was easy, but I made the mistake of pinning my bib onto the front of my jersey and later had to switch it to the back. I met up with my fellow Chicago Running Bloggers for a quick picture. I finally got to meet several bloggers whose blogs I've been reading for awhile including Amanda and Jess! My fellow ambassadors and I also joined together for a picture. These ladies did a great job promoting Venus de Miles over the last few months! 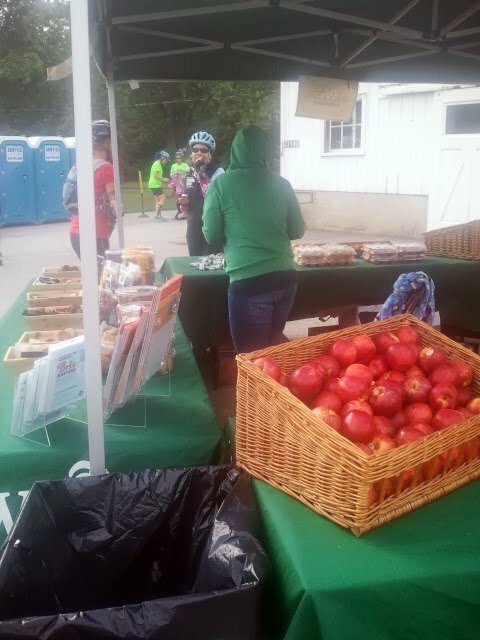 Before heading to the start line, I grabbed a banana and a coffee from the breakfast table. I've heard great things about the food at this event and my first encounter did not disappoint. Three different kinds of nut butter-peanut, cashew, and almond, and several muffin options were available. This was my first chance to try cashew butter and although I am not a huge fan, I'm glad I was able to try it before buying a whole jar. Before we started, we got to hear from a Greenhouse Scholar which is the organization Venus de Miles supports. It was a nice touch to hear the stories of the scholars to remind the riders who and what they were supporting by riding and raising money. After the singing on the national anthem, the first wave was off! 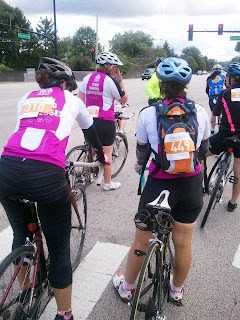 I fell into a comfortable pace with Jenny, Kelly, and Erin and we pedaled our way through Lake Forest. 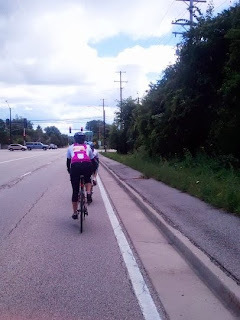 The 61-mile route wound it's way west towards Lake Zurich following low traffic roads and bike paths. Many of the larger intersections had police officers or other volunteers directing bikers and traffic. It was obvious that safety was extremely important to the organizers of the event and I am very grateful for that. Each rider received a route map, but I never even referred to mine as the route was well marked. The aid stations were positioned about every 15 miles and they were amazing. 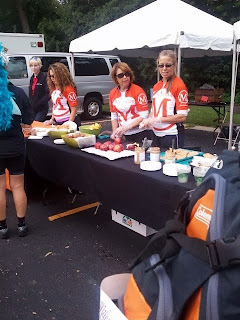 Each had quite the spread of Whole Food goodies including two-bite brownies, chocolate chip cookies, ginger snaps. Plus plenty of fruit, bagels, nut butter, and Luna bars. I made sure to grab a few extra Luna bars and Clif shot gels and bloks for my stash at home! If you leave this ride hungry you are really doing something wrong! The weather was a little atypical for late July and it was a bit chilly and overcast all morning. I was very glad to be wearing my arm sleeves and calf sleeves. The clouds looked a bit ominous for a while, but thankfully, we made it all way with only a few light sprinkles. The camaraderie on was great and I saw lots of festive people in costumes and a few men in drag. 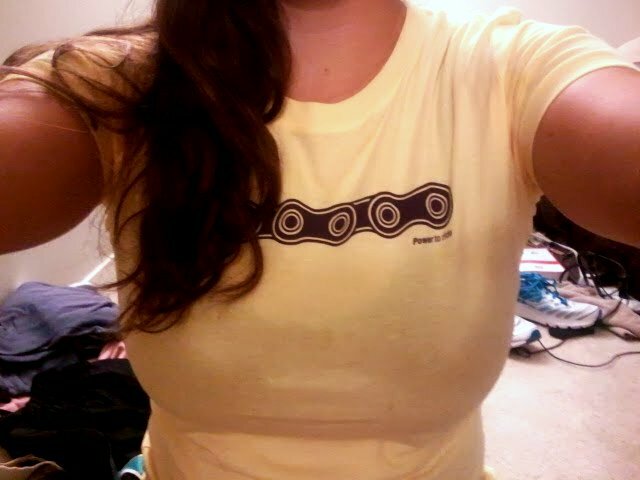 I really want to wear a costume next year. We arrived back at Lake Forest College around 1 pm and made our way to the finish line. I was a little disappointed by the finish line as there was no cheering at the end and was a little bit of a letdown after 64 miles. 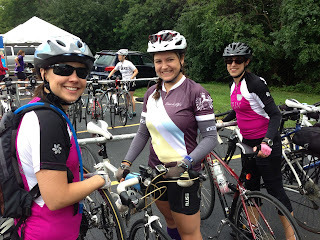 The route was supposed to be 61 miles but there were a few extra tacked on there. Once we were off our bikes, I walked around a bit to the different vendor booths and collected a few more goodies. I tried to get in line for a massage but was disappointed to be informed that the vendor was leaving at 2 pm and wasn't allowing anyone else in line. Instead I opted for a mini facial from the Tricoci Beauty University. I enjoyed a turkey pesto sandwich and chips for lunch along with my two free cocktails from North Shore Distillery. Of course, no meal is really complete without dessert so I enjoyed some whiskey and pecan ice cream from Jeni's Splendid Ice Cream. The ice cream was amazing! We sat around chatting for quite a while and were around the last to leave. That meant more goodies for us and I left with some pretty flowers from the table centerpieces. We did get to hear from some of the new Greenhouse Scholars at the post-ride festival. I was happy to learn that one of the scholars has chosen biomedical engineering as his field of study! Greenhouse Scholars has a whole person approach to helping under-resourced students. They are not only provided help with college funding but mentorship and peer support to help the succeed in college and beyond. 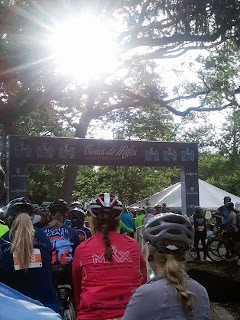 You can still support the 2013 Venus de Miles ride here. Overall, I had a great experience and I really can't wait to participate again next year. 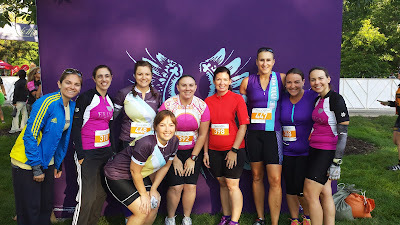 The Venus de Miles team really knows how to put on a great ride.